Price Reduced! Quiet and peaceful setting with house and cabin. Near new 100 m2 (almost 1100 sq ft) , 2 bedroom, 2 bath well constructed home with large great room, double doors on front and back of great room, large secured windows through-out, carport with storage, utility room. Excellent drainage with french drain. Convenient kitchen. 300 sq ft. Cabin has one bedroom with high ceilings, full kitchen, tiled bath. Storage building and laundry facilities. Cabin rents for $30 to $40. per night. 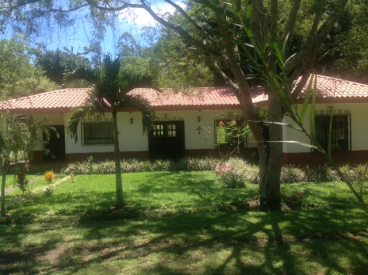 Sits on lot with almost 3000 m2 level and well landscaped lot with house and cabin. Many young fruit trees including orange, lemon, avocado, bananas, mango, grapefruit, etc. Municipal water. Owner financing available. Located near the end of La Castilla street with 24 hour security. Quiet setting in one of the best neighborhoods in Paraiso. Easy access off highway between Orosi and Paraiso. Less than 15 minutes from Cartago. Owner also has almost 2 acre (8000m2) adjoining lot with magnificent view of river, lake and Orosi Valley also for sale at the price of $215,000.